And of course our HW-UCLA friend Andy (Agnes Schweitzhoffer) already was proclaiming UCLA the champs. 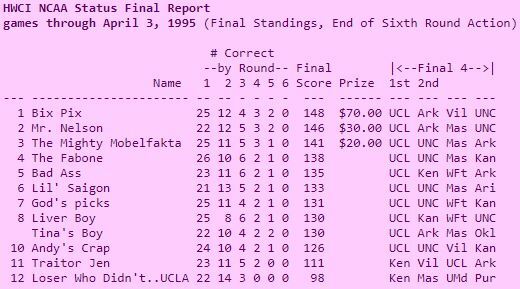 The final standings was much simpler back then (though you can see it was manually typed as the UCLA title win shows 0 for the top 10 although the total points is correct) although the txt format is still the same as today. And you can see 10 of 12 picked UCLA and in what has happened a few times, I finished 4th, just out of the money. For all 25 pools, the point system per round has been the same (2-3-4-6-8-12) and entry fee has been the same ($10). We introduced the total points in final tiebreaker in 1996 and the $40 Bonus in 2003. Our first webpage was in 1996 (http://www.sci.CSUPOMONA.edu/~smtamashiro) and this blog started in 2009. Loser Who Didn’t Pick UCLA is the only nickname that never got properly truncated to the nickname character limit of 21, hence the ellipses. Now, I manually modify the long nickname down to 21 characters before the pool starts. Hence this year “Where Have U Gone Steve Fisher” officially became WhereUGoneSteveFisher. Nowadays, you don’t see UCLA much in these pools. But the HW-UCLA folks of David, Andy, Man (Late Entry), and Fernando (Bix Pix) are still playing, 24 years later.